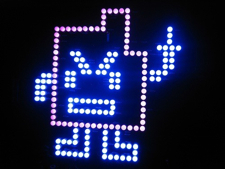 That's right: The Aqua Teen Hunger Force marketing campaign had been under way in ten cities for " a few weeks" by the time some non-basic-cable-subscribing Luddite in Boston freaked out the whole of Beantown by mistaking a wall-mounted LiteBrite for a bomb. Kids: Do not take your Etch-A-Sketches out of your room, or you may be arrested as a terrorist. Or a hoaxter. Because, goodness knows, anyone in their right mind might easily mistake a plastic rectangle with a picture on it for an improvised explosive device and start a citywide panic via TV news before the authorities have the slightest idea of what's going on. That's called Homeland Security. Don't mass outbreaks of unnecessary panic and fear make you feel secure? What's the root word of "terrorism" again? You know, if the goal of terrorists and the whole point of terrorism is to scare the sh-t out of us so badly that we leap ten feet in the air whenever someone says "boo," then the terrorists are clearly kicking our national asses. Evidently, this is a conspiracy by Bostonians to spread fear and uncertainty -- terror, if you will -- that Martin Scorsese may not win his long-deserved Oscar. Why did he have to shoot -- er, I'm sorry, film -- the movie in Boston, for heaven's sake?!?! All Boston politician and broadcasters who have perpetuated and promoted this hoax should be arrested, fined, and forced to watch the Cartoon Network 24/7 for 60 days, until well after the Governor's Ball. And they should be forced to apologize -- to the Mooninites, Turner Broadcasting, and to all the people of the world, for being so reckless and irresponsible. This is just one of many, many times to come when I will dearly miss Molly Ivins. She would have had a ball with this. Next Article: The meaning of "articulate" Previous Article: What was YOUR favorite comedy of 2006? What was YOUR favorite comedy of 2006?